_The Caswell County Partnership for Children participates in the State Employee's Combined Campaign. Our agency code is 2333. 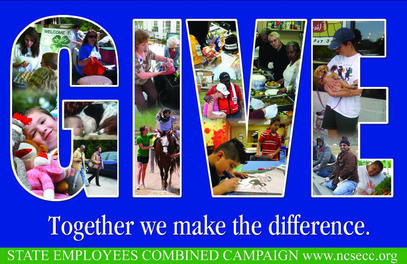 Virtually all state employees and retirees are eligible to participate in the State Employees Combined Campaign. In addition to permanent full-time, part-time and time limited employees, you may also ask temporary employees, interns & contract employees if they would like to participate. Just remember, they cannot contribute by payroll deduction, but they can make a gift by cash, check or credit card. What is the duration of my payroll deduction and when does it begin? Deductions begin in January and continue through December of the year following the campaign pledge. Do I need to fill out another Pledge form for this year’s pledge if I have given in the past? Yes. A new form or online pledge must be completed every year. Yes, if you itemize. A copy of your pledge form serves as a receipt for tax purposes, but you may need additional documentation (a pay stub, a copy of a check, a credit card statement, etc.). Consult with your accountant or tax advisor for details. Who determines how my contribution will be used? You decide by designating your contribution to one or more charities listed in the 2011 SECC Giving Guide. The SECC does require that designations to a single charity total at least $10 to lessen the administrative costs of the campaign. How Are Charities Approved for the Giving Guide? All charities listed in the SECC Giving Guide must apply for admission annually and meet the campaign’s eligibility criteria established by regulations that govern the State Employees Combined Campaign. The criteria that the charities must meet can be found on our website at www.ncsecc.org under the “Federations” category.